Wow, time sure does fly – December 10th already?! I apologize for my absence on the blog lately – but then again, I don’t because so much goodness has been happening around here and I’ve stepped away from my online presence to soak it all in. The holidays are such a magical time of year, aren’t they? We had an amazing time in Chicago for Thanksgiving, and last week was spent celebrating James and my birthdays, which are just four days apart (so fun!). My 29th birthday was on Wednesday, the 3rd, and Touch A Life has a policy that gives employees the day off on their special day, which is such a treat. I got my stretch on at yoga and my sweat on at City Surf, treated myself to my favorite juice and smoothie at The Gem, picked up some birthday goodies at J. Crew, and got a foot massage at my favorite place. James and I noshed on filet mignon, barbecue ribs, creamy spinach dip, and French fries at Houston’s for dinner, toasting with martinis (for me) and whiskey (for him). It was the perfect day. James’s 30th birthday was on Sunday and I threw him a surprise party! It was the best. Nearly 35 of our closest friends came to celebrate James and he was so totally shocked when he walked into our house – we nailed the surprise! My super talented friend Bri took photos of the day, which I’ll share here soon. 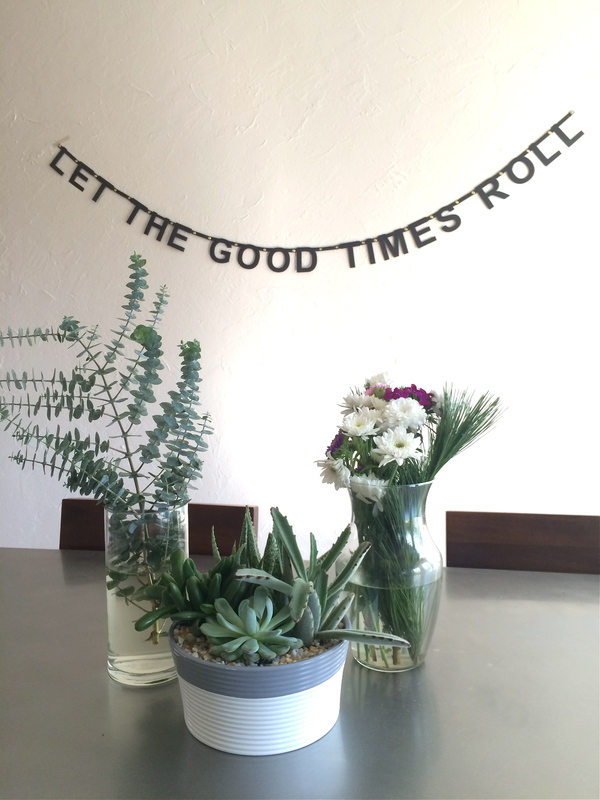 I had so much fun planning the decor (a few party remnants are pictured above), snacks, and drinks, and all of our friends pitched in with setting up, throwing James off, and keeping the secret about the party. 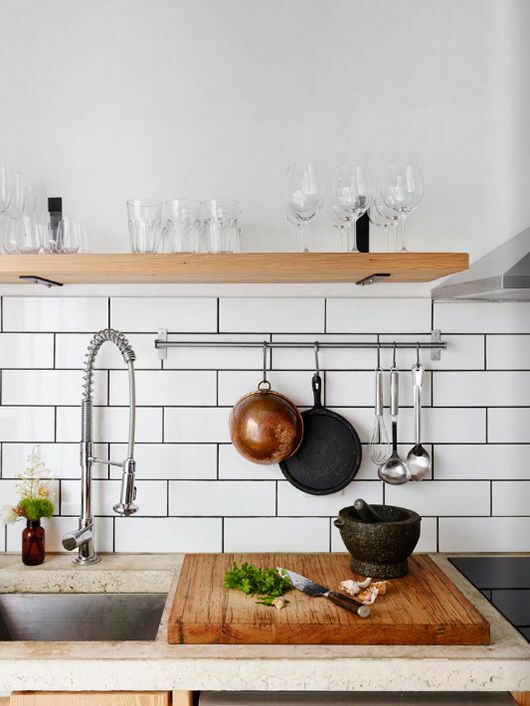 It is the best party I’ve ever hosted, filled with so much fun, love, and good food. James had a fantastic time, which made me so happy. Holiday events are in full swing, which I love! Tonight is a Christmas-themed girls night in at Korena’s, and tomorrow the Black Frames are playing at a charity wrap party hosted by Fullosophie. My dear bestie Becca and her boyfriend Mark are coming in from Nashville to attend a wedding this weekend, and I can’t wait to see them (and eat tacos at the best spot in town). Sunday night marks Laura, Kyla, and my fifth annual Christmas besties dinner, and the following day is my favorite event of the season (tied with the besties dinner, of course) – the Cone Christmas dinner at Patrick and Lauren’s, where Patrick cooks an entire holiday meal filled with delicious seasonal favorites. James and I are going to check out the Highland Park lights with Callie and hot chocolate in tow, and we’re scooting down to Austin the weekend before Christmas as a special treat to one another (also with Callie in tow, as we’ll be staying at my favorite hotel). I’ve been cooking some of Shauna Niequist’s recipes, as I planned, so I’ll be sharing a recipe tomorrow, as well as some fun posts the rest of the month! But if I go MIA again, have no fear – I’m just enjoying all that the holiday season has to offer, namely the fact that we get to spend this month thinking of the amazing Christmas story and Jesus’s birth. What a beautiful season – I hope you are loving it as much as I am! It’s Monday once again, but don’t despair – this time next week we’ll be celebrating Memorial Day, wahoo! Yesterday I got to take a fantastic workshop: a Calligraphy Brunch with the über talented Lauren Essl. The workshop, hosted by Fullosophie, was held at Chicken Scratch + The Foundry, a restaurant & bar that I love for its amazing outdoor space, super cool decor, and beyond delicious chicken dishes. 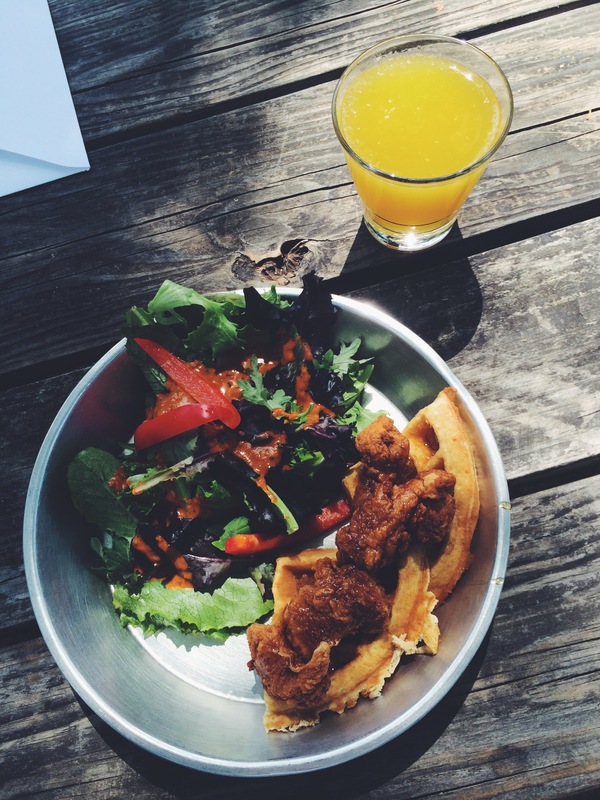 There was a group of 15 women ready to learn calligraphy, and we kicked off the class with salads, bottomless mimosas, and supremely tasty chicken and waffles. The weather was absolutely perfect so we started class outdoors, munching on our brunches on picnic tables while we learned the basics of calligraphy from Lauren. After a brief and helpful overview, we got set up inside The Foundry, the bar area of the space, and got to work with our pens, nibs, and lettering samples. Lauren was such a good teacher – informative, encouraging, and helpful. She answered individual questions quickly and kindly, and she made her rounds at the table, pausing for each person to show us samples of her lettering, all the way through the alphabet (yep, from A to Z). She made us adorable packets of take-home goodies, including a personalized notebook, a fun pink pen, washi tape, ink, extra nibs for our calligraphy pens, and a pretty notecard with a bright, fun envelope. Calligraphy is a whole lot harder than it looks – although, actually, I never thought it looked easy in the first place. Everything from the way you hold the pen to how much pressure you put on the nib is calculated precisely, and it took me awhile to get a handle on this new way of writing. In spite of the challenge, I found that calligraphy is really fun and it’s sort of relaxing in a way – it’s almost like it’s therapeutic. 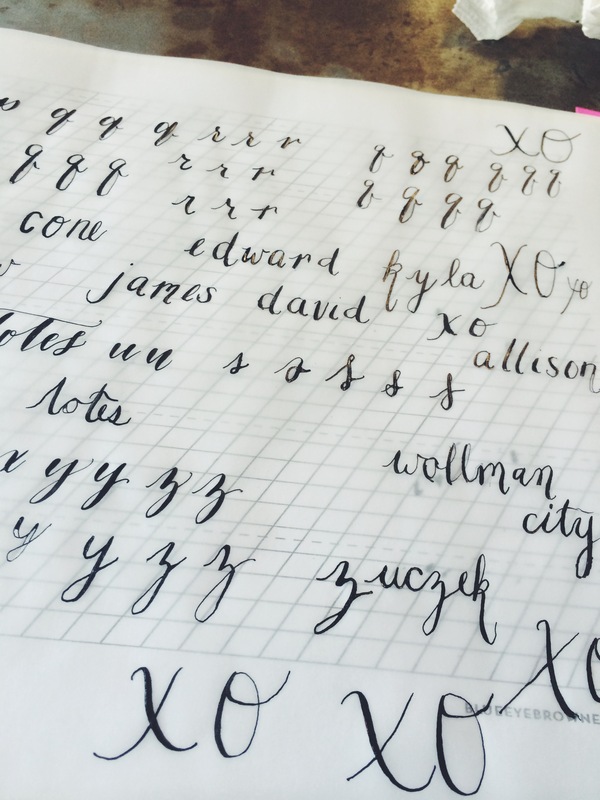 Anyway, I can’t wait to continue practicing so that someday I can address letters and make my own notecards and such – don’t you think it would be cute to have a large XO on a notecard, something similar to what I was working on below? If you ever have the opportunity to take one of Lauren Essl’s workshops, I highly recommend that you sign up immediately – not only are they fun and interesting but they also sell out in a heartbeat. I learned so much and had an absolute blast, and Lauren was a fabulous teacher. Fullosophie did a great job hosting the brunch, too! It was the perfect way to spend a Sunday afternoon. We made it to Friday! Do you have big plans for the weekend? I have nothing on the agenda tonight or tomorrow, aside from a City Surf sweat sesh or two (and maybe some champagne drinking in the backyard with some girlfriends). 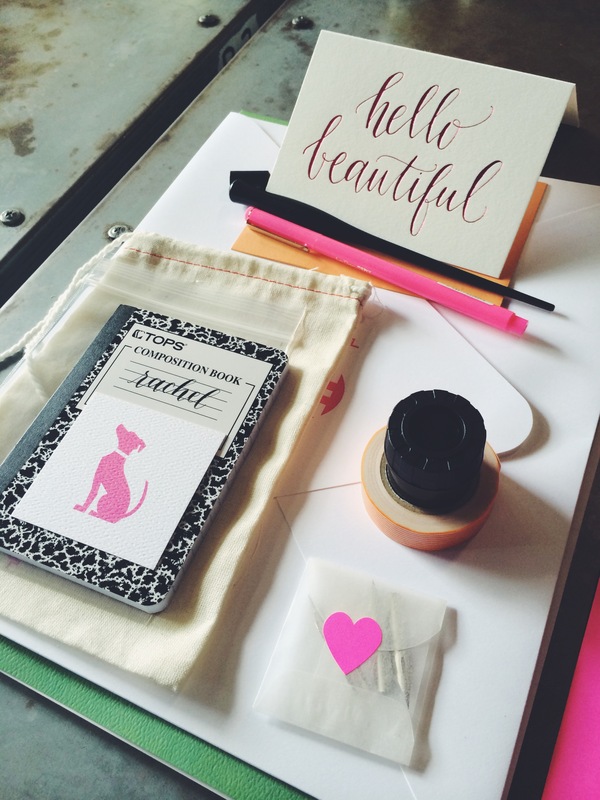 On Sunday, I’m so excited to take attend Calligraphy Brunch workshop at taught by the super talented Lauren Essl. Not only have I always wanted to take a beginners calligraphy class but I also have always wanted to learn from Lauren, who I actually met at the Dallas Flea when she was designing stationery and other fun paper products back in 2011. 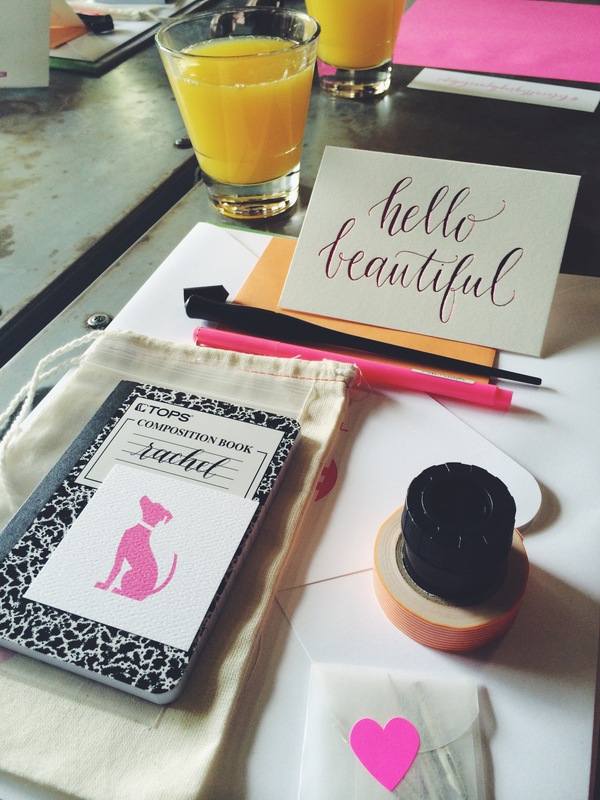 Calligraphy lesson + mimosas – is there anything better? On a whim, James and I made a distinctly non-vegan version of this delicious peanut butter cup pie on Monday night and it was to die for. Recipe to follow! If someone can tell me where these hilarious cocktail napkins are from, I will send you candy & hugs. We’re a few months late but James and I watched the series finale of Dexter last night and my initial reaction was to loathe the ending (no spoiler alerts here, don’t worry!). But after reading this interview with the show’s producers, it gave me a new perspective that helped me appreciate the conclusion so much more. If you watched all eight seasons of Dexter like we did, what did you think of the finale? P.S. Happiest of birthdays (on Sunday) to my amazing, loving, and generous dad! I wish we could drink wine and celebrate together!